Those pants are stunning! You look marvellous!! Love the stripes with the floral pants!! I love the pants!!! They are gorgeous! Those pants are amazing! And it looks great with stipes and leather. I adore this outfit. I love the stripes with the floral pants. soo pretty <3 i love those pants:) it's a perfect spring outfit! I love the look!!! Jacket + floral + stripes, the perfect combination!!! Love the pants, yo look great! What a great mix of patterns and textures. These are floral pants I can definitely get behind. You have impeccable taste! love the print on those floral pants! the color is stunning! You're working it girl! Looking good! those pants are adorable! i'm super jealous of your courage when it comes to working with prints. So jealy of these pants. This outfit is so good it hurts. SO cute!! this might be one of my favorites of yours! You pair the stripes and floral print so flawlessly! Loving the floral pants! What a great idea to pair it with the stripe shirt! Very cute! Those trousers are quite simply fabulous! Looking great with the stripes. Thank you! I have a pair of floral pants that I felt so limited by- never knew what to wear with them! But the way you threw stripes into the mix just works! I'll definitely remember this combo! I've got the black and white stripes going on today as well, along with the Zara blazer. Adore the pattern mix so very much, love stripes and floral. Seriously, you kill it every single time! I want each pair of your patterned pants. You've convinced me they're not that scary and totally wearable. Adore your style! Love your use of stripes and floral, grounded by the simple shoes! Those pants are amazing, I Love the pink floral, so perfect! Love your jacket! And the accessories, of course. Gorgeous! Love the print mixing. This is gorgeous! 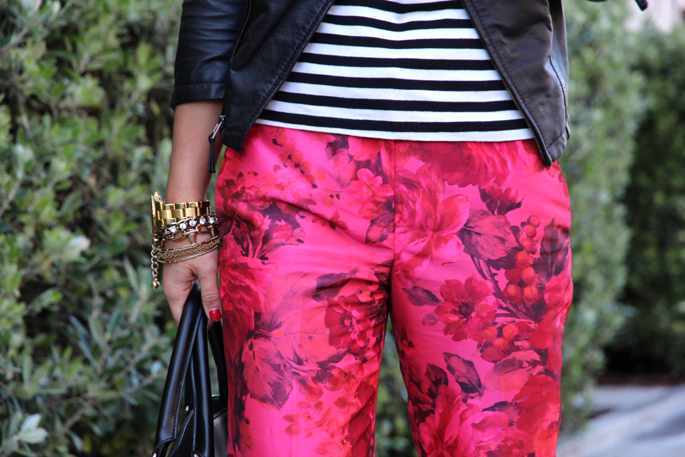 The floral pants with the striped top is a perfect combination, and the leather jacket & pumps make it so chic! LOVE this! love your hair , your style !!! everything!!!!! Such a great look! Love those pants on you and whoever cuts your hair should be given an award! My first time checking out your blog - love it!!!! Holy shiz!! I love those pants! Loving those pink floral pants. Real edgy with the leather jacket. I am in love with those pants, and you are rocking them perfectly! The print of those pants is incredible! Beautiful, and love how you've combined the trosuers with strips! This is just too perfect my friend! so good - really like everything! the shoes are great. I don't like print mixing much, but you are rocking this! So cute!